A terrific red with a real Bordeaux character. Lovely fruit and balance. most prized and historic of all plantings in the Dry Creek Valley. October most of our fruit was already harvested. is a seamless experience from start to finish. FERMENTATION Average of 20 days, pumped over twice daily. into the late spring and early summer. The summer growing season was unseasonably cool. Harvest was temperate and canopy management was a key to achieve optimal ripeness in the grapes. Unwelcome rains came later into harvest – fortunately, much of our fruit was already picked and safely at the winery. apple characters, zesty citrus and a wonderful sense of balance and freshness. A perfect patio sipper, Chenin Blanc is summertime in a bottle! 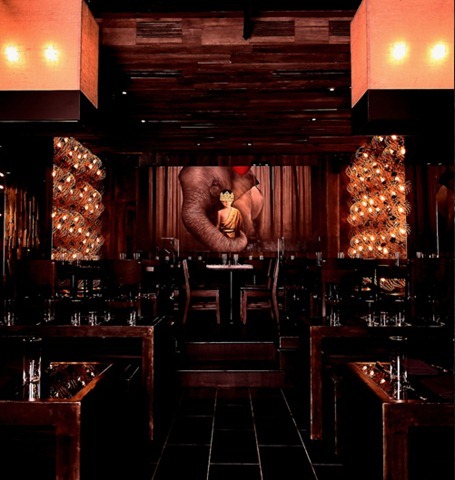 With no big signage or neon signs, Ember Room is hidden in plain sight near the corner of West 45th St & Ninth Avenue. Suspended above the entrance are four thousand authentic handmade Thai temple bells, whose soothing and resonant tones are said to create a peaceful and meditative state. Designed by internationally renowned Thai chef Ian Chalermkitticha, Ember Room’s menu takes on an existing culinary trend in Bangkok: described as "progressive Thai comfort food", the menu is both firmly rooted in Thai tradition and seamlessly adapted to the selective integration of other culinary cultures. Signature dishes range from Italian-influenced Green Curry Lasagna, with fresh mozzarella and parmesan baked with a rich green curry Bolognese, to Chef Chalermkitticha’s signature Chocolate Baby Back Ribs grilled with surprising and irresistible BBQ Belgian chocolate glaze. They are fork-tender, absolutely delicious and a steal at $7(all of the carefully cooked dishes are fairly priced). Ember Room is the latest venture of New York City-based restaurateurs Ace Watanasuparp and Chatchai Huadwattana, founders of Chace Restaurant Group, whose recent successes include Spot Dessert Bar, Obao, and Reserve wine Bar. The restaurant design, boldly envisioned by internationally acclaimed hospitality designer Roy Nachum, mixes rustic and contemporary through the use of rich colors, distressed wood, and brushed metals. Near the white-veined black Carrera marble bar, the Marble Poet’s Lounge is a floor-to-ceiling 25-foot wall of 200 year-old reclaimed wood, overlaid with oversized gold-leaf Chinese calligraphy-the characters point out that sharing food and company is the greatest form of wealth. 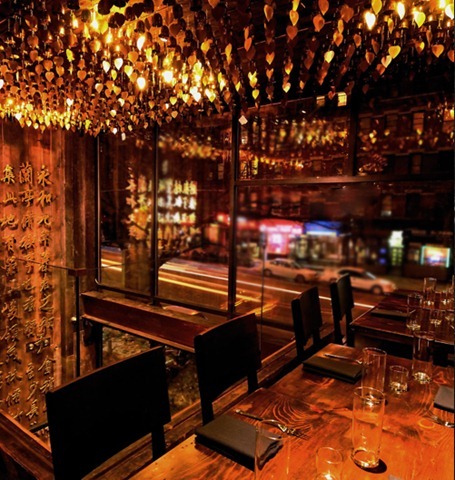 Downstairs, the focal point is the Ivory Prince Terrace: a raised dining area with symmetrical walls of mirrored bronze, stacked with metal frames evoking authentic Asian lanterns, and lit with Edison light bulbs. The room unites around a striking original painting by Nachum of a child in a forest, protected by an elephant. Upstairs, an open Mezzanine overlooks both the Marble Poet’s Lounge as well as the restaurant’s floor-to ceiling façade, with its view of the lights and bustle of Ninth Avenue. seared “diver” scallops, chili jam glaze, pomelo salad, roasted pepper-lime dressing; Terra Cotta Fish Cakes, crispy rice-crusted red chili paste fish cake, ember room sauce and the aforementioned Chocolate Ribs. Signature ENTRÉES offer Lobster Pad Thai, Bangkok street-style pad thai, herb-poached lobster; a divine Red Chili-Glazed Sea Bass, freshly baked, sweet and spiced glaze, celery root puree, gailan and Heritage Pork Belly, chaing mai spiced braised pork belly, root vegetables, asian herbs, fresh ginger. sweet chili sauce; “Nam Prik Ong” Lettuce Wrap, northern thai-style bolognese, fresh vegetables, crispy eggplant and that Green Curry Lasagna with green curry bolognese, fresh mozzarella, parmesan, ground beef. There are fun plays like the Thai Chili Mac & Cheese, thai chili jam, smoked bacon, onion, fresh mozzarella, parmesan, and house-made breadcrumbs and a not-to-be-missed concoction called: Thai Pastrami Meatballs, ground pork, bacon, sweet tamarind glaze, chinese mustard’. The chef is a master of mussels and oysters, whether Steamed “Icy Blue” canadian mussels, lemongrass, spicy and sour bouillon, garlic bread or beautifully presented Half-Shell Fried Oysters, crispy fried oyster, sautéed bean sprout, garlic chive, and a zesty sriracha sauce. For a twist, check out the fun Ember Original Lobster Roll, with homemade sour cream, chili jam, celeriac, shallots, mango served with crispy 7-spice fries and mayonnaise. like the Had Yai Volcano Chicken (a mere $16) for oven-roasted turmeric-coconut marinated chicken, green chili sauce, brined for three days and served flaming. Service is surprisingly benevolent and there is is short and attractively priced list of wine, beer, sake and such.Cocktails are generous and well constructed, and the hose versions are fun. Don’t miss the Thai iced tea (lavender tea is also terrific), nor fabulous desserts, including all homemade iced cream (the chocolate Grenache is to die for); a light and lovely Meyer lemon layered crepe cake; or a rich and decadent caramelized coconut cheesecake. Certainly the definitive choice for creative Thai food near the theater district, Ember Room is one of the best Thai restaurants in Manhattan. Rating A Major. Two Delightful Whites From Different Parts of the Worlds for $20 and Under. The Whitehaven Sauvignon Blanc 2010 embodies the quintessential Marlborough style: Full-flavored and medium -bodied with fragrant notes of citrus, gooseberry and ripe tropical fruit followed by freshly cut herb undertones. A brilliant straw color, this rich and elegant wine refreshes the palate with a clean, crisp, long finish. We recommend enjoying our 2010 Sauvignon Blanc while it is young, but the wine is capable of developing nicely over the next two years if carefully cellared. Established in 1994, Whitehaven Wine Company is a small, privately-owned winery located in Blenheim, New Zealand. Whitehaven winemaker, Sam Smail, has earned a reputation for turning our brilliant, distinctive and critically acclaimed premium Sauvignon Blanc and Pinot Noir from the world renowned Marlborough region of New Zealand. Located across the Wairau and Awatere Valleys of Marlborough, New Zealand, our Sauvignon Blanc vines are pruned to four canes each and trained along our standard trellis system, with vertical shoot positioning for maximum exposure to sunshine and fresh breezes. The canopy is carefully manicured to achieve open, healthy vines which produce balanced, full-flavored fruit during the growing season. Although it did not appear promising to begin with, the 2010 season outperformed the superb 2009 vintage in the Marlborough region of New Zealand. The latter half of the growing season experienced high temperatures and ripening advanced rapidly, delivering the harvest on time. From late December on the season was warm and dry. The harvest was short and sharp, rarely interrupted by rain, providing for stunning structure, amazing depth and flavor along with balanced ripeness. The fruit was machine harvested in cool evening conditions, destemmed, must chilled and lightly pressed with minimal skin contact. The free run juice was settled to achieve a high degree of clarity. The clear juice was fermented in upright stainless steel fermenters with selected yeast strains to preserve the inherent fruit flavors. Winemaking techniques and handling were reduced to promote the natural fruit flavor and intensity found in Marlborough Sauvignon Blanc. Vibrant peach, tropical fruit and gooseberry aromas and freshly cut herb undertones. A brilliant straw-colored wine with lemon tones, this wine refreshes the palate with a long, clean finish. This wine is superior to others that sell for a few buck less and the smooth balance, gentle acid and easy-going fruit prove our point. A real delight with sushi, oysters, goat cheese and chicken. In the local Gallego language of Galicia in Northwest Spain, the name Rías Baixas means “the lower fjords, referring to the narrow fingers of deep water that stretch far inland. The white Albariño grape thrives in this region of rains and mists. Locally, Albariño is called “the wine of the sea” (and is, unsurprisingly, a perfect match for seafood). Produced under the stringent rules of the Rías Baixas Denominación de Origen (DO), Martín Códax Albariño is thoroughly food friendly, and designed to be consumed young. This is an aromatic wine, elegant, dry and crisp on the finish. The key aromatic and flavor notes are pear, passion fruit and apple. Acidity is bright and integrates well with aromatic elements into a balanced whole. Albariño stands on its own as an aperitif but reaches its glory stage when matched with food. This is not only because of the firm acidity, but also because of the wine’s mouth-engaging fullness. 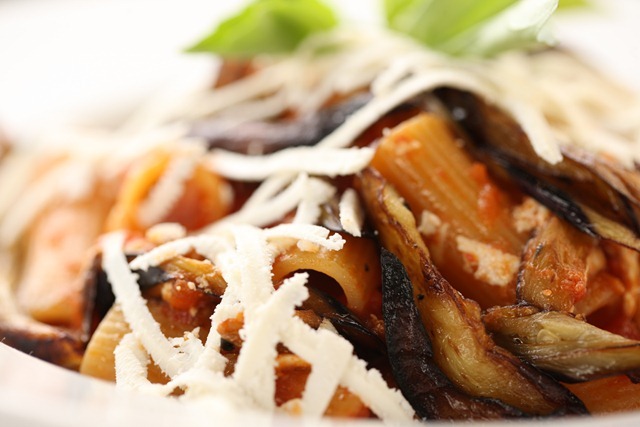 Seafood, poultry, light salads, and lightly-sauced pastas are only a few of the many possibilities. The summer of 2010 was on the hot side with little precipitation. Following an excellent flowering season, we saw correspondingly high yields and good ripening among the grapes, all the while maintaining desirable levels of acidity (and lower levels of malic acid). These conditions were ideal for the production of a well-structured, well-balanced Albariño with floral and stone-fruit notes. For this 100% Albariño wine, grapes were hand-picked in mid-September 2010. Grapes were de-stemmed but not crushed, which allowed whole berry membrane pressing to preserve varietal character. After juice settling, fermentation occurred in stainless steel at 18º Celsius for three weeks. Approximately 15% of the blend was allowed to undergo malolactic fermentation, leading to enhanced flavor complexity while preserving the acidity. Following fermentation, the wine underwent light sur lie aging for four months, with no oak contact. A refreshing food friendly white wine, crisp, elegant and dry, showing aromas and flavors of pear, passion fruit and apple with bright acidity. We love the wines of Spain and this is one of our secret favorites. Always dependable, you’ll feel like you are drinking a wine worth double the price. 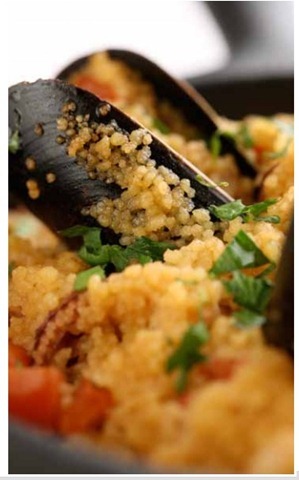 Enjoy it with seafood paella, poultry, veal and oysters. 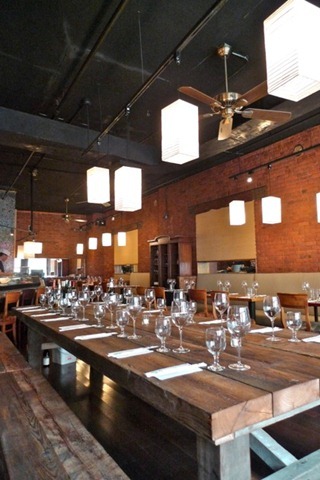 Zutto is located at 77 Hudson St, New York, NY 10013. And is open for lunch Monday-Friday 11:30am-5:30pm, dinner Sunday-Thursday 5:30-10pm, Friday-Saturday 5:30-11pm. For more information, please call (212) 233-3287, and visit zuttonyc.com. The name Zutto may be familiar to connoisseurs and Tribeca locals as it was the first sushi restaurant in the area 30 years ago. Now, while the name and location remain the same, the new chef Joshua Smookler has recreated the core concept and turned Zutto into an Japanese American izakaya-inspired pub. Yes, they still have sushi, but the real star is seen in the Japanese menu, which draws from Smookler’s French culinary training and includes an extensive wine, beer, shochu and sake program. Chef Smookler, a Korean raised Jewish who grew up in New York, came into the professional kitchen world in an unusual way. After he finished his bachelor’s degree, Smookler was supposed to study medicine. But, he decided first he wanted to see more of the country. He got as far as San Antonio, Texas before he needed to stop driving and work. He saw an ad for wait staff at the French restaurant L’Etoile and went in for the position dressed in a T-shirt, shorts, and sandals. Lucky for him the owner was Jewish and when Smookler started speaking to him in Hebrew, he got the job. His training can be seen not only in the stunning way he plates his food, but in the solid flavors and innovative bites he offers, especially in his Japanese pub-style food. 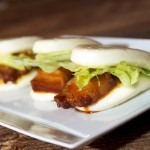 Take the Steamed buns (but go easy . . . are terrific), Smookler whips up variations that include a classic Asian style pork belly with miso-mayonnaise, tender and sweet short rib, and a Kobe beef patty with hijiki, his version of an American slider. Other menu items also speak to the izakaya style like the finely pounded fish that gets breaded and fried to create salty fish “chips” with a side of spicy edamame and jalapeño dip. The result is a deceptively simple and memorable creation. For the signature ramen, the chef’s favorite dish, Smookler starts by making the various broths, a process that takes almost two days to complete. 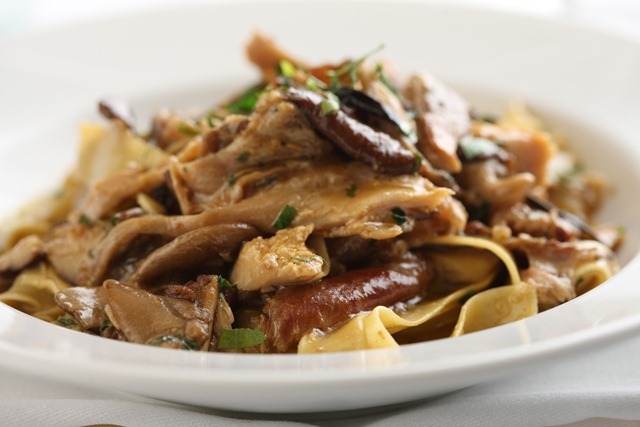 He pours the rich, velvety liquid over long, tender noodles made from Smookler’s own recipe and tops the dish with various ingredients. Start with the tonkotsu classic bowl, which comes with smoky chasu, sweet pickled ginger, sesame, and kikurage, also known as wood ear mushroom. It is the star. For heftier fare, go for Smookler’s take on steak frites, which uses tender Kobe beef ribeye. The portion isn’t huge, but the quality is superb and the fries are wonderful. While their menu remains sophisticated, the giant communal table in the center, cozy bar, intimate banquette seating, and soft Japanese lanterns hanging overhead helps create the down-to-earth vibe Smookler wants. It’s easily a place where you can pop in for a great bowl of ramen, a snack, and a glass of beer or wine. Actually, the beverage list alone is worth the Tribeca trek as it features Asahi on draft that is actually brewed in Japan and shipped here. In bottles they offer spiced Schneider Weisse, rich Allagash Dubbel, and light and nutty brews by Hitachino Nest’s. On the wine menu Smookler taps into his years working as a wine director and has created a masterpiece of whites, reds, and sparkling from all around the world. He arranges on the menu from lightest in body, to the heaviest. For example the list of whites starts with a Hautes Noelles’ 2010 Muscadet Sur Lie and ends with Le Vieux Donjon’s 2010 Rhone blend. For reds he features over two-dozen bottles including CVNE Imperial’s 1999 Tempranillo and Kenzo Estate’s 2007 Bordeaux blend. All wine prices are value oriented and lower than many places charge for the same bottles. Another feature on the drink list is the flushed out sake list. Where the original restaurant offered few, the new Zutto has around 60 including unfiltered Hakushika “Snow Beauty” Junmai, earthy Shichida, and the pear tinged Yaegaki Mu. Loyal Zutto customers will also find the classic sushi list re-imagined save for the traditional triangle shaped Tribeca roll, which has been on the Zutto menu since the beginning. Other rolls Smookler has created to express the more wild side of things including the animal roll, a feisty maki with short rib, jalapeño, garlic, and a sweet and savory soy glaze, which gets served on the bone from which the beef came. Also innovative is Smookler’s bright yum yum sae woo, which is made with a thin, lime-green tofu skin and wrapped around tempura shrimp, lettuce, and crab, giving it a crisp texture and more of a summer roll feel than traditional sushi. Dessert is an experience unto itself as Smookler comes up with all sorts for fun creations like the salty-sweet chocolate-caramel crème du pot and a melt-in-your-mouth caramelized brioche with grilled bananas and homemade vanilla ice cream, which is so airy and light it’s hard to believe it’s really ice cream. He used to offer a dish called a tasting of three chocolates and rum, which consists of a molten chocolate with three chunks of chocolate, paired with three amazing single barrel aged rums from different parts of South America.On our visit, it wasn’t available, but we adored “coffee and donuts,” a fabulous coffee semifreddo with foamed cream and zeppole donuts. It would put any Italian restaurant to shame. Whether you come to Zutto for a light snack and a drink, a full dinner, or for lunch, grabbing a seat at the community table or outside, once they open their glorious French doors, gives you the full Japanese pub experience with an international twist. Service is friendly and the ramen is as good as it gets. In 1965, founder Rod Strong was the first to plant chardonnay in what would later be recognized as the Chalk Hill American Viticultural Area (AVA), established officially in 1983. He recognized the region as distinct from the rest of Russian River Valley for its unique chalky white soils, which impart a subtle mineral character to wines grown there. The 2010 vintage started with a cool and fairly wet spring that remained mostly frost free. The late rains generated a healthy canopy, but one that required careful management to avoid green flavors. The cool spring evolved into an exceptionally cool summer, punctuated by a three day heat spike in August which reduced yields in many varieties. September started out warm and ended the same way, giving us the ripeness we were waiting for, and we harvested the last of our Chalk Hill chardonnay on October 8th. Barrel fermentation in new and seasoned French oak added toasty vanilla and spice complexities, and during 9 months of barrel ageing, we regularly stirred the "lees" in barrel, which adds a creamy texture and increases richness on the palate. Encouraging secondary fermentation adds additional complexity, and in the glass the wine is both creamy and crisp, with ripe apple, Meyer lemon, wet stone, and spiced vanilla flavors. Enjoy over the next 1-3 years. SRP: $20 is excellent value. A lovely example of what California can do with Chardonnay. Loved the clean, fresh melon hints and food friendliness. Rod Strong was among the first modern wine pioneers with a vision to plant pinot noir in the Russian River Valley. In 1968 he planted our heritage River East Vineyard in the alluvial clay-loam soils adjacent to the winery in Healdsburg. Today the Russian River Valley is well established as one of the premier pinot noir growing regions in the world, and we continue to rely on the original River East Vineyard as a core contributor to our estate vineyard bottling. The 2010 vintage started with a cool and fairly wet spring that remained mostly frost free. The late rains generated a healthy canopy, but one that required careful management to avoid green flavors. The cool spring evolved into an exceptionally cool summer, punctuated by a three day heat spike in August which reduced yields in many varieties. September started out warm and ended the same way, giving us the ripeness we were waiting for, and we harvested the last of our Russian River pinot noir on October 7th. Soft and silky, with intriguing floral and crushed pomegranate aromas, this medium bodied wine was aged for 11 months in small French oak barrels, which added a hint of toasty vanilla and spice complexity. Ideal for current enjoyment, this pinot noir will hold nicely over the next 2 to 4 years. SRP: $20. Soft, easy going and perfect for chicken, light seafood and goat cheese. 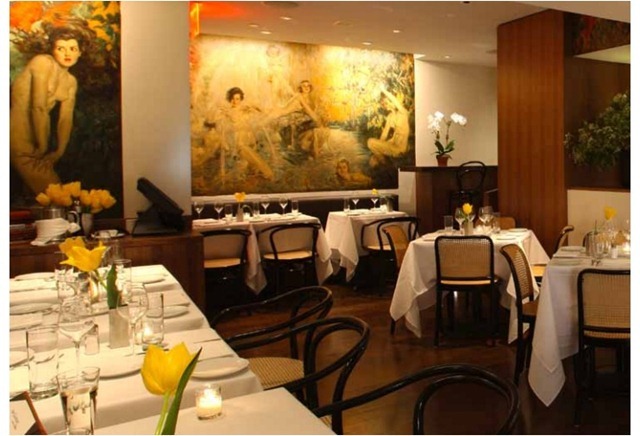 THE LEOPARD at Des Artistes is located at 1 West 67th Street between Central Park West and Columbus Avenue. The restaurant is open daily for Dinner from 5PM-11:30PM. Lunch is served Monday – Friday from 12PM-3PM and brunch hours are Saturday and Sunday from 11:30AM-3PM. 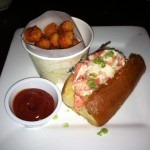 Reservations are recommended: 212-787-8767 or www.theleopardnyc.com. Housed in one of New York’s most legendary and famous buildings, the Hotel des Artistes, THE LEOPARD at Des Artistes offers Southern Italian cuisine inspired by the area once known as “The Kingdom of the Two Sicilies.” Restaurateurs Gianfranco Sorrentino and his wife, Paula Bolla-Sorrentino, who brought New York the successful Il Gattopardo (Italian for The Leopard), and the former Sette MoMa Restaurant at The Museum of Modern Art, have totally renovated the former Café des Artistes space. 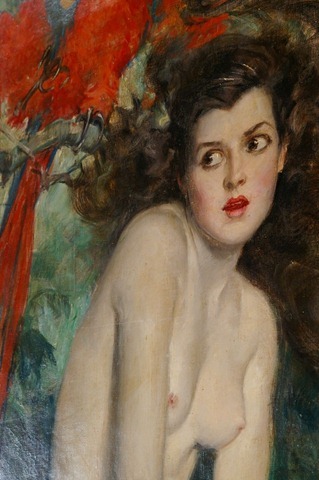 The restaurant’s breathtaking murals were given a much-needed restoration to their original colors, to bring back their atmosphere of romance and fantasy. Architects Roger Hirsch and Myriam Corti renovated the restaurant to create a sophisticated and comfortable dining experience. Classic and modern details are subtle and refined in homage to the artful spirit of The Hotel Des Artistes. Diners are seated at roomy and luxurious banquettes situated throughout the dining rooms, which boasts a combination of terrazzo floors complete with large, playful zinc circles, and rich walnut floors. Walnut-clad columns bring dramatic warmth and refinement to the interior, and a new lighting system accentuates the mythical murals’ beauty. 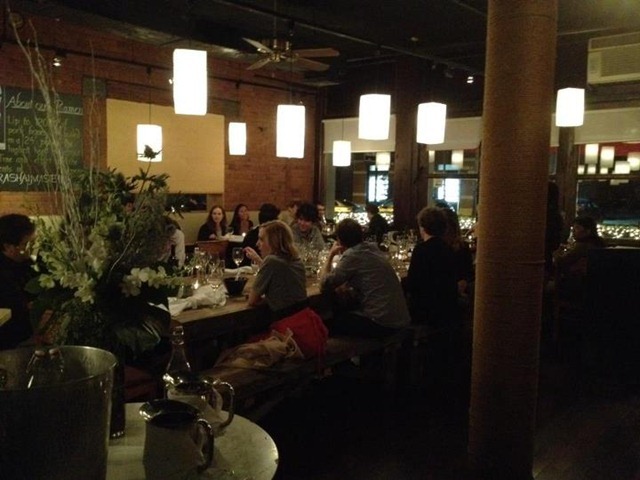 The overall effect is clean and airy, creating a contemporary elegance in which to enjoy memorable cuisine. 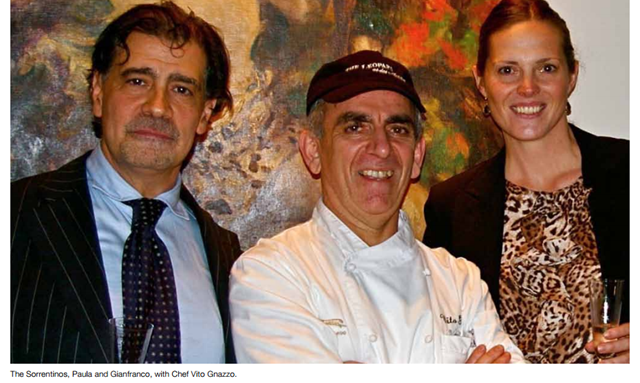 Executive Chef Vito Gnazzo, who is also the executive chef at Il Gattopardo since its foundation, along with Chef de Cuisine Claudio Cristofoli, created the Southern Italian menu that finds its roots in the culinary traditions of the regions of Campania, Basilicata, Calabria, Apulia, Sardinia, and of course Sicily. His genius lies in his ability to utilize traditional recipes and maintain culinary honesty, while keeping is creations light and toothsome. Everything tastes authentic; nothing tastes old fashioned. “Taste” being the operative word. Chef Gnazzo’s hand with seasoning is awesome. 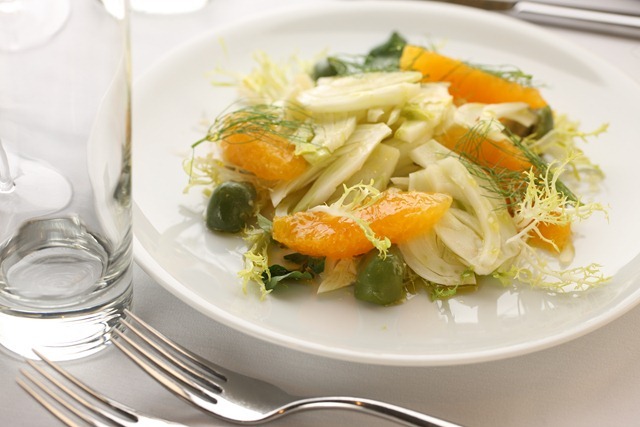 Guests may begin dinner with appetizers including Eggplant and Smoked Buffalo Mozzarella timbale with spicy tomato sauce; Sardinian “fregola” with clams and mussels in a shell fish broth and Fennel and Orange Salad with Nocellara olives dressed with olive oil and white wine vinegar (below). We adored melt-in-your mouth Grilled Octopus and celery potato salad with olive oil and lemon dressing, and green olives. Imported White Asparagus (a special) was the best we have ever tasted this side of the Atlantic. All ingredients are the finest quality, whether imported or sourced from local purveyors. Ravishing pastas include Bucatini with sardines, onions, wild fennel, peanuts and raisins; Rigatoni “alla Norma” with sautéed eggplant and aged ricotta cheese in a tomato sauce (pictured below) and remarkable Ravioli filled with braised artichokes and burrata in a light tomato marjoram sauce. Signature entrées consist of Filet of Mediterranean “Branzino” wrapped in parchment paper with baby vegetables and herbed olive oil; Lamb Loin sautéed in a red wine and tarragon sauce, served with braised pearl onions and carrots and Roasted Berkshire Tender Pork Loin in its own sauce, served with fingerling potatoes, mushrooms and artichokes. For something really special, go for one of the best Grilled dry aged rib eyes, in New York, served with crispy rosemary French fries (serves two people) . You may never visit you favorite NY steak house again. 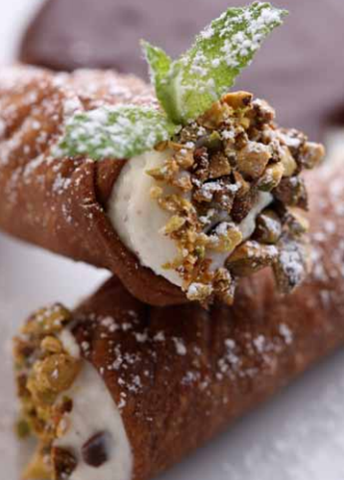 The “temptation” menu was crafted by Gnazzo and Cristofoli and includes delectable desserts such as a crunchy Cannoli filled with sheep’s ricotta milk, chocolate chips and Bronte pistachios; Warm Bartlett Pear over puff pastry with caramel sauce and Warm Lava Chocolate Cake served with a side of artisanal ice cream. Best of all, Traditional Zabaione with fresh mixed berries, is whisked tableside and is perfection. 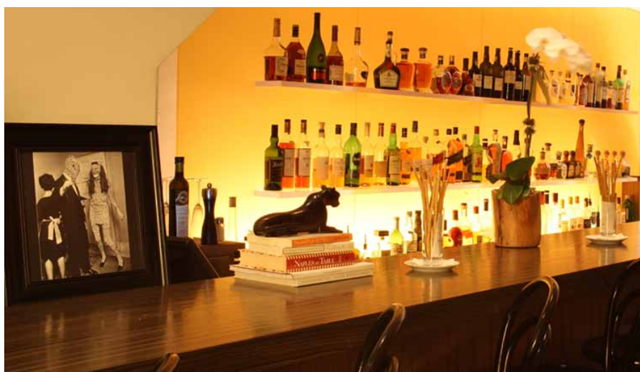 Diners can also enjoy drinks and light bites at the newly redesigned bar. Gianfranco Sorrentino, who also oversees the beverage department of THE LEOPARD, collaborated with Sommelier Marco Irato to create the restaurant’s wine list, which offers over 160 bottles of Italian whites and reds, fifteen of which are by the glass. A sprinkling of French Champagnes also have a presence on the menu. Signature cocktails include a Neapolitan Martini with Limoncello and Vodka and Donnafugata Campari shaken with Grand Marnier Orange.The wine list is admirable and affordable. We were delighted with a sprightly Manzoni Bianco 2011 “Villa Brunesca” at 14 the glass and a lovely Super Tuscan 2007 “Poggiassai” Poggio Bonelli, which was $21 for a glass. Cocktails are expertly constructed and generous. Two Chardonnays at Affordable Prices Make Ideal Summer Drinking: William Hill and Frei Brothers Excel. 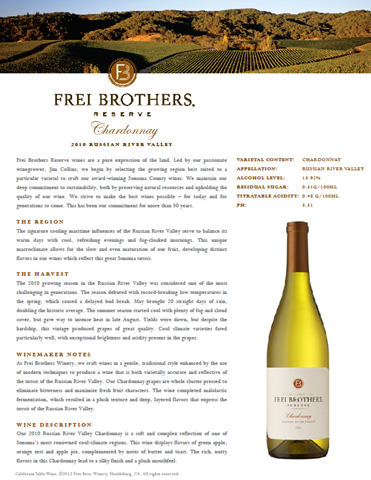 Frei Bros. Reserve 2010 Russian River Valley Chardonnay, at a suggested retail price of $20.00, goes beautifully with seafood, light cheese, chicken and Japanese cuisine. The balanced fruit and good acid make it the ideal wine for summer drinking. This 2010 Russian River Valley Chardonnay is a soft and complex reflection of one of Sonoma’s most renowned cool-climate regions. This wine displays flavors of green apple, orange zest and apple pie, complemented by notes of butter and toast. The rich, nutty flavors in this Chardonnay lead to a silky finish and a plush mouthfeel. 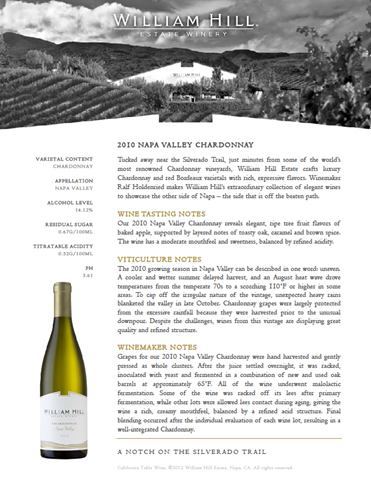 William Hill 2010 Napa Valley Chardonnay at a suggested retail price of $25.00 is another option. Somewhat more graceful, you’ll love the medium-light body and subtle finish. You’ll also adore it with shrimp and shellfish as well as goat cheese and duck. This 2010 Napa Valley Chardonnay reflects a transition to a new contemporary style by revealing elegant ripe tree fruit flavors of baked apple, supported by layered notes of toasty oak, caramel, and brown spice. The wine has a moderate mouthfeel and sweetness balanced by refined, juicy acidity. The 2010 growing season in Napa Valley can be described in one word: uneven. A cooler and wetter summer delayed harvest, and an August heat wave drove temperatures from the temperate 70s to a scorching 110°F or higher in some areas. To cap off the irregular nature of the vintage, unexpected heavy rains blanketed the valley in late October. Chardonnay grapes were largely protected from the excessive rainfall because they were harvested prior to the unusual downpour. Despite the challenges, wines from this vintage are displaying great quality and refined structure.